From dawn to dusk, the city is a blank canvas and yours to utilize. 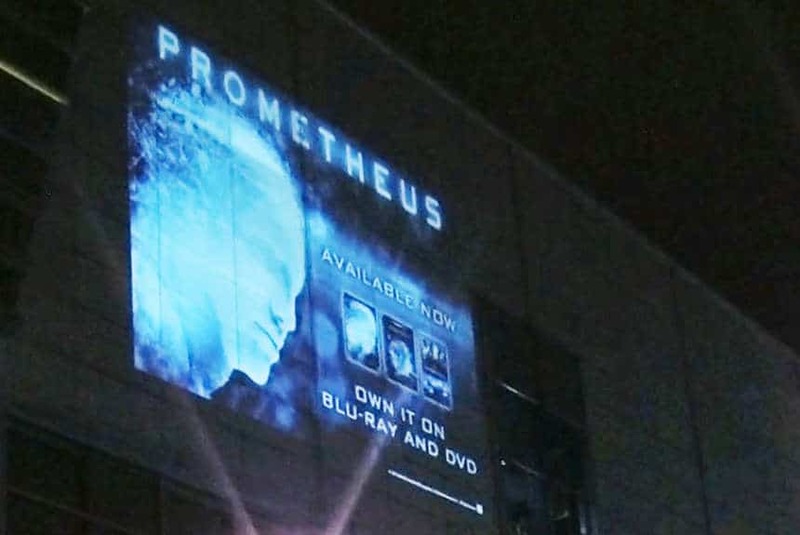 By hijacking an area for a Video or Laser Wall Projection, you’re cleverly stopping your specific target market in their tracks, with an entertaining and captivating piece of advertising. 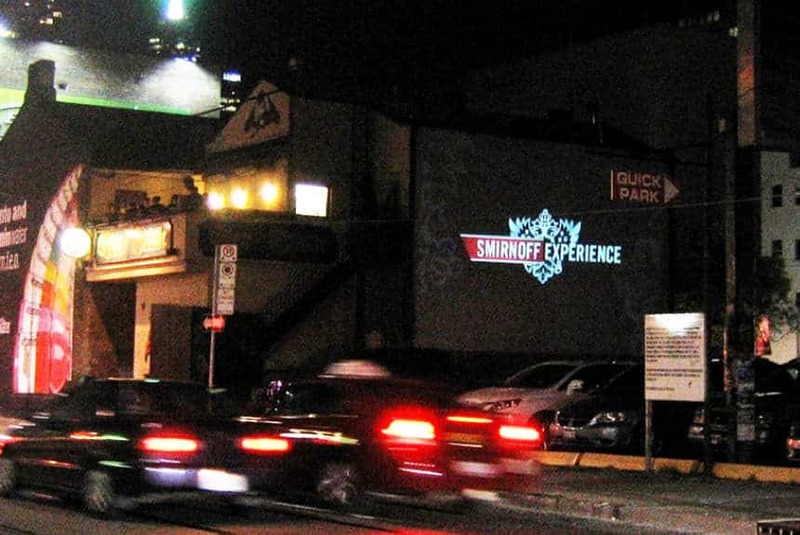 As the van with projector technology drives past buildings and walls, it creates one or more unique ad spaces as your message is illuminated for everyone to see and interact with. The vehicle can park and continue to project on a single spot, or drive around the city highlighting various locations. Your customized projections can be static or moving depending on your needs and location. Bring existing footage or a brand new project to the big screen with Video Wall Projections, or choose to incorporate text movements, motions and neon colours with Laser Wall Projections that really bring your campaign to life. Laser Wall Projections offer an advantage over Video Wall Projections in being able to originate from a lot further away (across an entire city if the line is unobstructed). It’s both intriguing and memorable to witness a projection that you can’t see where it’s originating from. Go big with a video or laser projection that’s high up (radiating up on to a skyscraper) and gain the attention of the entire market. Draw people closer for phase two of your campaign that could include street teams and brand ambassadors handing out flyers, contests, giveaways etc. Or choose to project at street level to appeal to a smaller, more intimate but highly relevant market. New technology allows you to get your audience involved to the point where their creations can be projected too. This in turn draws even more attention for your promotion. Rolling your campaign out across social media, where your target audience become part of it is has proved a popular and smart next step, with texts, comments and creative suggestions all being included as part of the live screening. This is experiential marketing at its best – your market becomes your marketers! Whether you opt for Video Wall Projection or Laser Wall Projection, you’ll be creating a unique and exceptional campaign that appeals to your demographic exactly. You can go where the people most likely to buy or use your product go. A specific bar, restaurant or club for example. This mobile medium allows you to be that precise in your advertising. So follow the crowds, until they follow you! 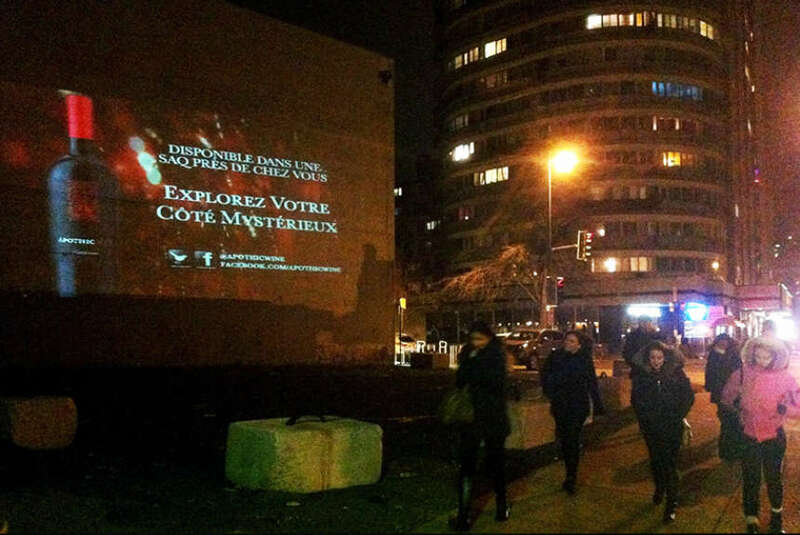 Mobile Wall Projections are an adventurous non-traditional medium. There’s often a tone of voice to the style that is edgy and stylish and typically the promo might be executed in guerilla style – popping up unexpectedly outside the latest ‘place to be seen’. Not many advertising vehicles can claim to be this cutting-edge in their appeal, but projecting imagery, videos and text onto city walls is now accepted as hip and stylish. For this reason, Wall Projections are now among the fastest growing out-of-home mediums in Canada. 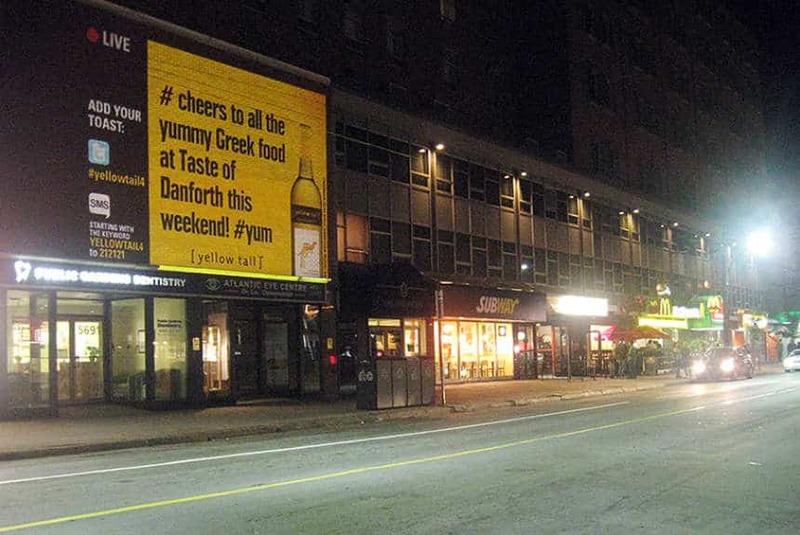 Highly visible advertising that gets your brand noticed is here.